I Fail… Again. I think I got something on my shoe? I’m working on some posts about my UI right now. However, taking illustrative screenshots of mods for the blog has proven more difficult than expected. 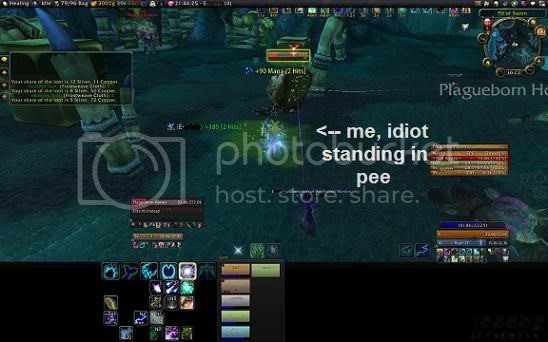 And I’m so focused on finding the button and taking the screenie that I look up and I’m standing in pee. Of course I can’t use THAT screenshot. Except as an illustration: DO NOT DO THIS. What is this “Rollplay” of which you speak? Also, DBM has added a “rollplay” (sic) timer to Culling of Strat, letting you know how long you have to get a beer before Arthas expects you to start killing zombies. As a rule, healers can stand in anything they want. What are we going to do? Yell at ourselves? "If you quit standing in the fire, I'd be out of a job"
So all you are doing in that Screen Shot is providing yourself with job security! A lot of my UI action shots are actually from me healing in places like Arathi Basin, Wintergrasp, or other PvP places where I can highlight the elements I use for PvE but I'm not as worried about death or wiping groups. I'm still participating, but in large-scale PvP, death is a naturally expected part of the process.